Ah the Roguelike genre. I have a love/love-ish relationship with them. In concept, they are very cool. If you’ve got a base enough story to go on, it can be fun. If it’s too complicated then it would be frustrating because some people may never get to the end. (You may feel free to put my name in there if you’d like.) It’s a rough balancing act in the game world to create, I assume. The story must be fun and engaging and make you want to come back for more or you’ll just want to throw your mouse through your monitor and get a Steam refund. No developer wants that… I think. Heath&Slash is no different from the other Roguelikes I’ve played and enjoyed. Its got it where it counts. 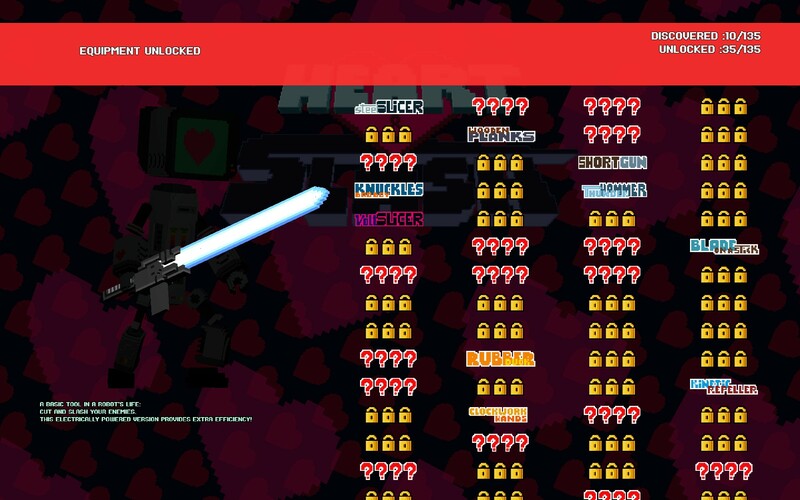 There is a crap-ton of things to unlock here. Will I ever get them all? Time will tell. My daughter would like me to try! Hearth&Slash is fun if not simplistic. Don’t get me wrong, you will die a lot. I believe most of your sessions will end in death because that is the very nature of this genre. Is it frustrating? Kind of. The gameplay is super-quick and it took some time for me to fully grasp the controls well enough to not blame my deaths on them. Through all of that, I was able to play for a good chunk of time and make some progress. Not that long though. While the game is fun, playing the same thing in a different, yet similar looking areas is fun for only so long. One needs to make notable progress to want to continue. I’ve started making it to what I’ll call the second stage, but I’m not really sure how far I’m getting. That can kill a session for me. Maybe I’ll play for twenty minutes, maybe thirty at my longest, but I inevitably die in about fifteen and just shut it down. I’ll come back to it after a short break and another drink. Nothing gives me more joy than seeing some love giving to games that I enjoy. At the same time, this level was very open and felt empty compared to the claustrophobic first level and all it had going for it. My only real gripe with Heath&Slash is the item system they’ve got in the game currently. I’ve unlocked a decent chunk of items including both weapons and gear. It’s neat that they have so many options, but some of them I’ve already come to lament showing up. While some of the weapon upgrades are blatant on what they do, some are more vague. I usually play with the rule: if the weapon is good, any upgrade will be great until proven otherwise so I guess this doesn’t fully matter. The gear is less obvious to me in their descriptions and that kind of frustrates me and gives me a sense of bliss because if I don’t know what something does, then I can’t tell if it’s doing its job or doing anything really other than setting off some special effect. Which is all well and good, I guess, but at the same time I have no hesitation to recycle a part for health at that point as well. Would I be willing to hold onto an item if the descriptions were better and I still couldn’t tell if it was doing its job? You betcha! If it said I was getting a defense buff, I would just trust in it. Telling me it winds time or something and I don’t see any sort of time-funk-ness… who cares. First suit ever given to me was a duck… I’m not sure what it did for me, but it sure was colorful. 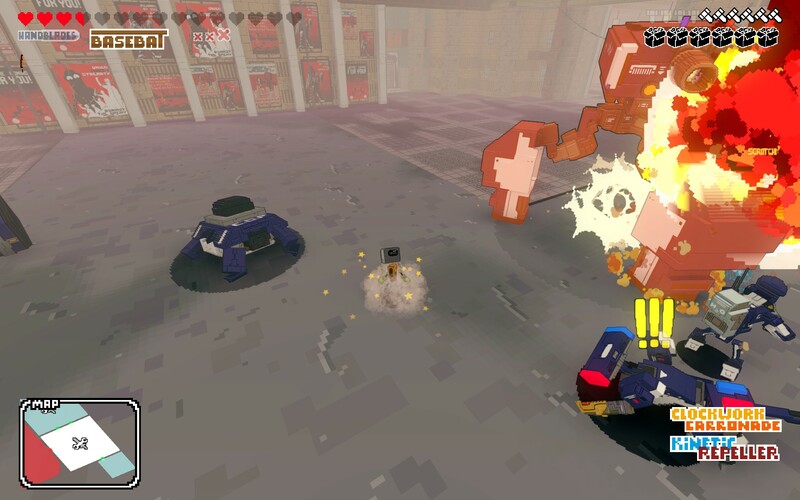 Visually Heart&Slash is a fantastic looking almost-voxel / almost-pixel 3D brawler in regards to the enemies. I’m not sure how to describe the visuals too much, but it is nice looking and gives a very playful style that helps the dying not feel as bad as it could if the aesthetic was a harsher, angry look which you’ll notice, there aren’t many of those on Steam. For good reason too. There’s a lot of variety on the looks and modes of all of the bots. There are basic models and they palette and weapon swap so you’re never short of a challenge from something you’ve defeated before and all of a sudden a similar bot shows up all armored up and laughs at your attacks. Stay on your guard! 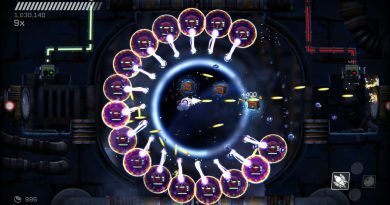 The level design pales in comparison to the enemies. 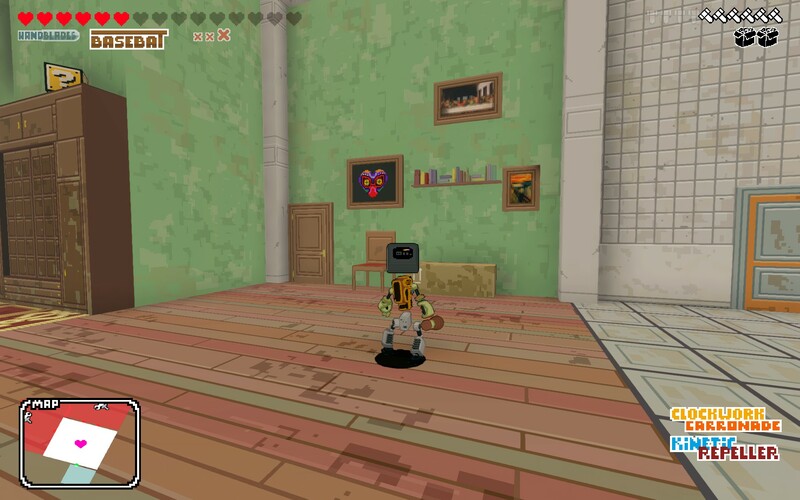 It’s not horrible, but compared to the design of the robo-baddies, the level visuals (for the first two levels at least) are nothing to write home about. On the same note, we could go back to the controls and remind you that you’re running around at mach 10 so you don’t spend too much time looking at the walls. There are points of interest in the levels that you can seek out. There are rooms with a set number of baddies and you’re not allowed to leave without killing them. It’s not much different for every other room for myself, but this time the doors close. (Same for the bosses actually.) I’m told that exploring all the rooms isn’t the main goal in this game. However, you get scrap from braking the bots and you then spend that to upgrade yourself. If you don’t explore too much, you won’t get too much so the upgrades won’t come as quickly as one may like. On the same note, I’ve not found many weapons so far that I like so I don’t need to upgrade myself too much. I usually upgrade one weapon up fully and then myself and call it good. I would upgrade my armor, but I usually forget about it since the descriptions on what they do aren’t great at times as I’ve mentioned. I tend to keep them around to recycle for some health when things aren’t looking good. 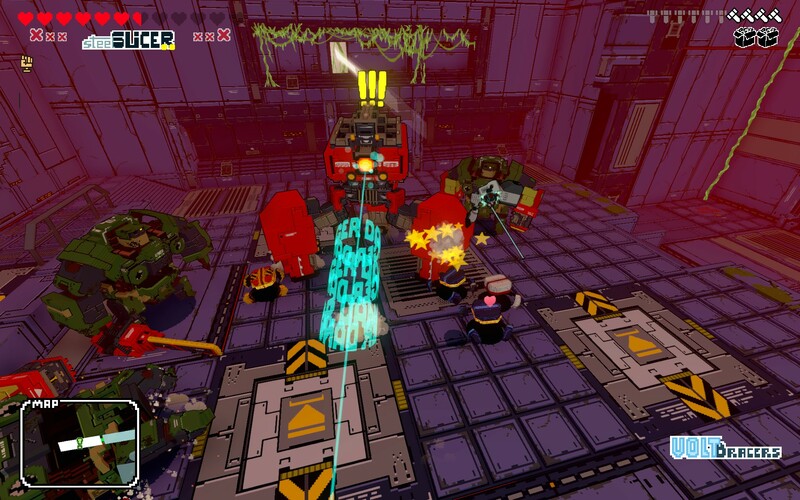 There are a lot of great looking baddies in Heart&Slash. I love how they look! It’s really fantastic. As a brawler, Hearth&Slash is fun. While my kids may enjoy watching me play, this is one of those Roguelikes that can be rather tough at times. Some enemies are push-overs and some simply poke you right in the eyes with both hands while you thought you had your hand up for and unbeatable defense. 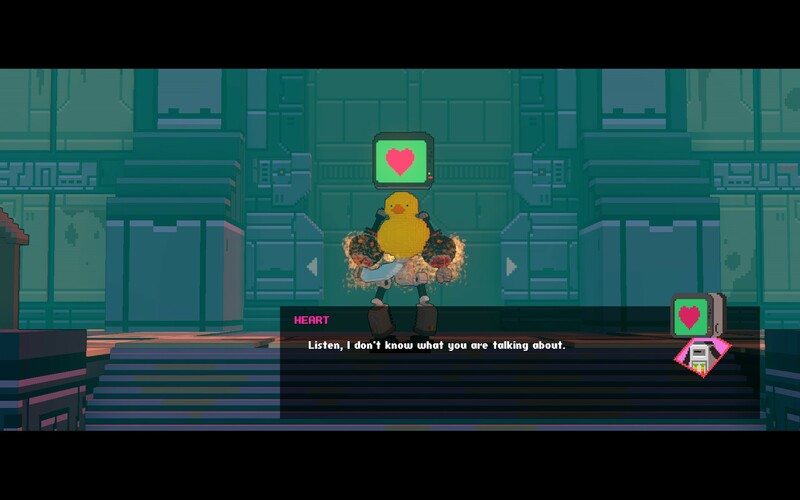 Visually a joy to play and with some sweet weapons to break faces with, Heart&Slash is a good pick-up-&-play title for short spurts, but I can’t play long sessions of it. With the procedural level design, I can at least come back at any time and get a different challenge.